Right now in Orlando, we’re finally getting some details and pictures from the next Star Wars movie, The Last Jedi. Here’s our first look at major new characters, returning favorites, and hints of what’s to come in the next new chapter in the galaxy far, far away. 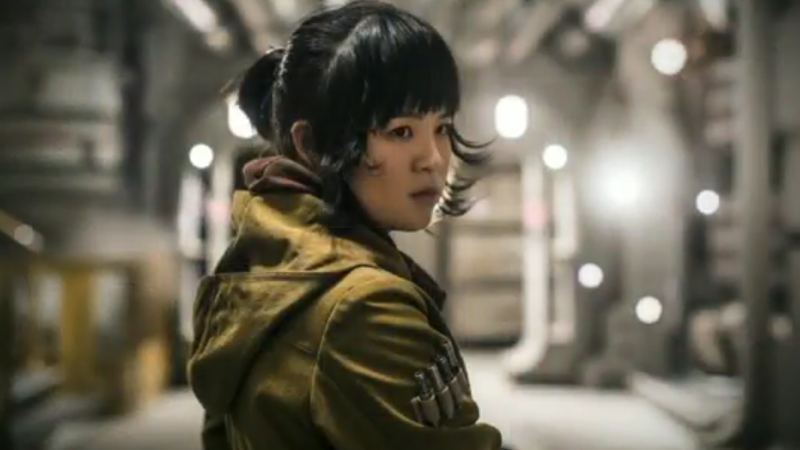 First up is our first look at the biggest new addition to the Star Wars main cast, Kelly Marie Tran, as Rose. Rose is a member of the Resistance, a maintenance worker. An unlikely hero, Rose isn’t actually a soldier—but she gets dragged into the adventure of The Last Jedi alongside ex-Stormtrooper Finn, becoming one of the main stars of the new film. We’ve got our first look at Luke Skywalker in the new film. Mark Hamill wouldn’t reveal much about what Luke is up to in this film, apart from the fact that everybody spent The Force Awakens obsessed with him. bBt he did discuss how much he’s loved trolling his Twitter audience with fake spoilers and hints. Daisy Ridley, however, did tease that Rey’s encounters with Luke would be a bit of a “never meet your heroes” moment, hinting that there’s going to be some tension between the Jedi Master and his new apprentice. Update: Speaking of Rey, we also got two beautiful new shots of her on a very rainy Ahch-to. She’s got a slightly new costume here, mainly in the form of a new poncho/cape over her outfit from the end of The Force Awakens, which I’m desperately hoping is going to be an action figure I can buy at some point. Ridley took to the stage and—despite Josh Gad’s repeated questions—still wouldn’t confirm if Rey has links to the Skywalker or Kenobi families in her history. However, she did tease that we would definitely be getting more of Rey’s backstory in the new film. Update: Here’s the spectacular teaser poster The Last Jedi. Faces! Lightsabers! Rey! It’s got it all. Update: The trailer is here! And it looks like the panel is over, but we’ve still got a few more tidbits from the panel to share. io9 will continue to have more exciting updates and information from Star Wars Celebration.